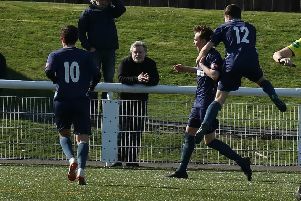 Last weekend saw a mixture of Cup ties and League matches scheduled to be played but once again the weather was the winner with only three matches going ahead. On Friday night at Palmerston Park Heston Rovers played hosts to neighbours Lochar Thistle in a Cree Lodge second round tie which the home side won by the odd goal in five to set up a semi final tie against Crichton. Lochar went ahead in the twenty first minute through Lee Martin but just on the half time whistle Grant Learmont scored an equaliser. A minute after the re-start Ross Halliday put Heston ahead and with 66 minutes played Sean Kevan scored goal number three for the home side. Seven minutes later Lee Martin scored from the penalty spot to set up a grandstand finish but Heston held on to progress in this particular cup competition. The other two games that escaped the winter weather were both South of Scotland League matches with St Cuthbert Wanderers and Creetown playing a re-scheduled match at St Marys Park following Castle Cary Park being unplayable for their scheduled Cree Lodge Cup second round match and Abbey Vale managing to play Dumfries YMCA at Dumfries High School. At St Marys Park Saints put eight goals past Creetown who could only manage a single consolation goal to leave the Kirkcudbright side reducing Edusport Academys lead at the top to seven points but with five games in hand which leaves them in a very strong position to land this season’s league title. Saints goals came through singles from Jack McMurdon, Phil MIddlemass and Scott Milligan with Steven Degnam adding a brace and Andrew Donely scoring a hat-trick with Stewart Taylor scoring Creetown’s consolation goal. Abbey Vale saw off the challenge from Dumfries YMCA with four first half goals with Lee Mailn and Craig Rudd scoring two goals each. In the 63rd minute Eddie Marshall scored for YMCA for a goal that only proved to be a consolation goal for the struggling bottom placed team.